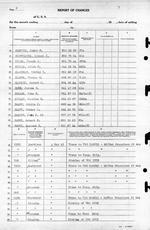 NOTES: A ship's Muster Roll only lists enlisted men; officer rolls are part of the Deck Log. 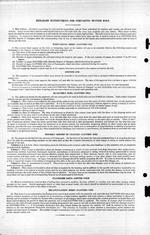 The Navy forms have been recreated below in a slightly modified format for better readability but the content is unmodified. Certified to be correct and that instructions regarding submission of rolls have been fully complied with. Vessel or station from which received, to what vessel or station transferred, where discharged and character of discharge; where deserted, and amount due or overpaid. Where died, cause of death and where and when buried. If passenger, give purpose of travel and final disposition. 4 ANDERSON, RUSSELL L. 823 69 05 EM3c " " " " " " "" "
9 BEAUSOLIEL, Armand 310 63 11 CBM USN Survivor " " " " "" "
13 BENDER, Henry 961 17 47 S1c " " " " " " "" "
14 BENWAY, Kenneth R. 801 50 93 S1c " " " " " " "" "
15 BERMEL, Frederick F. 810 70 77 S1c " " " " " " "" "
17 BERTHIAUME, Lionel J. 806 75 04 S1c " " " " " " "" "
21 BLANCK, Thomas G. 626 02 32 Y.1c " " " " " " "" "
22 BLONDIN, Robert J. 824 96 44 GM3c " " " " " " "" "
23 BLUE, Jerome G. 961 17 09 S1c " " " " " " "" "
25 BOULEY, Charles R. 202 03 87 PhM3c USN " " " " " "" "
28 BROPHY, John J. Jr 707 17 76 FC1c(T) " " " " " " "" "
5 BURBANK, George H. 573 18 77 S1c " " " " " " "" "
12 CASPER, Vernon E. 833 68 52 F2c " " " " " " "" "
13 CASTLE, Vernon L. 386 99 05 S2c " " " " " " "" "
16 CHARRON, Andrew Isidore 761 86 82 GM3c USNR Wounded 4 May 1945 Trans. To Hosp Ship. 19 CLARK, Jasper L. 605 43 33 GM2c " " " " " " "" "
23 COLECOM, Richard A. 809 40 38 F3c " Wounded " Trans. To Hosp Ship. 24 COLEMAN, Russell P. 826 43 62 S2c " " " " " " "" "
4 DASSAN, Louis A. 807 38 02 S1c " " " " " " "" "
5 DE FILLIPPIS, Nicholas 810 29 03 F1c " " " " " " "" "
8 DE LAPP, Wesley M. 961 16 90 S1c " " " " " " "" "
10 DERAGON, Eugene L. 573 19 30 S1c " " " " " " "" "
11 DEMENCHUK, Henry M. 826 39 68 F1c " " " " " " "" "
14 DOLAN, John Michael 801 56 32 S1c " " " " " "
20 ELDER, Lawrence A. 761 86 30 QM3c " Wounded " Trans. To Hosp. Ship. 23 ERSTAD, Dwaine B. 961 17 91 F1c " " " " " " " "
29 FLETCHER, Lester E. 936 59 51 SoM3c " " " " " " " "
30 FOLAND, Norman 560 68 49 MoMM2c " Wounded " Trans. To Hosp Ship. 3 FORTIN, Charles K. 823 65 13 Cox " " " " " " " "
4 FOTI, John W. 809 41 38 F1c " " " " " " " "
5 FOTIE, William R. 628 81 10 RM3c " " " " " " " "
8 FRANTZ, Robert R. 820 85 76 S1c " " " " " " " "
12 FRIEDMAN, Sidney 817 73 04 F1c " " " " " "
14 FULLER, Paul S. 822 14 93 GM3c " " " " " " " "
17 GLEASON, John Christopher 320 57 92 CWT(AA)(T) " " " " " " " "
20 GOLOSINSKI, Alexander J. 726 33 04 MM2c " Wounded " Trans. To Hosp Ship. 22 GRAFF, George N. 726 32 60 WT2c(T) " " " " " "
24 GRAUL, George V. 202 76 79 WT2c(T) " " " " " " " "
25 GREATHOUSE, Thomas J. 866 96 93 Cox " Missing " Sinking of USS LUCE. 27 GREEN, William B. 933 59 48 StM2c " " " " " " " "
28 GRIFFITH, James R. 961 17 77 F1c " " " " " " " "
29 HALL, Lewis B. 665 65 24 S2c " Wounded " Trans. To Hosp. Ship. 30 HALL, Louis P. 761 67 82 S1c " " " " " "
5 HERZOG, John A. 809 45 35 S1c " " " " " " " "
7 HILES, Orville L. 956 58 46 S1c " Wounded " Trans. To Hosp. Ship. 9 HOLT, David L. 845 06 45 F1c " " " " " "
11 HOPPE, Floyd G. 620 27 03 M1c " " " " " "
18 INTERLANDE, Alexander 825 13 36 S1c " " " " " " " "
20 JACKSON, Frank L. 653 85 79 RdM3c " " " " " "
22 JACKSON, Lewis W. 822 96 77 MM3c " Survivor " " " " " "
24 JOHNSON, C.R. Cox " " " " " "
26 JONES, Ashton O. 934 23 38 SoM3c(T) USNR " " " " " " "
28 KARR, Lester Parry 320 74 17 BM1c " " " " " "
29 KECK, Urstle C. 966 14 83 S1c " " " " " "
30 KEWER, Charles H. 807 60 33 S1c " " " " " "
1 KIEFER, Clayton K. 707 30 53 S1c USNR Wounded 4 May 1945 Trans. To Hosp. Ship. 3 KIRTS, Elmer B. 321 26 46 CGM(T) " " " " " "
4 KRUPA, Michael M. 812 19 47 MaM3c(T) " " " " " "
5 LAKE, John C. 761 86 26 S1c " Wounded " Trans. To Hosp. Ship. 7 LAURENCE, Wilfred E. 757 52 89 S1c " " " " " "
9 LAWTON, Wayne J. 654 71 65 RT1c " Wounded " Trans. To Hosp Ship. 10 LEBRUN, Richard L. 573 19 32 SM3c " " " " " "
12 LEONE, Joseph P. 809 43 44 S1c " Wounded " Trans. To Hosp. Ship. 13 LIETZ, William V. 723 07 32 TM2c " " " " " "
17 MACHACEK, Frank 757 52 93 S1c " " " " " "
18 MALABY, Ira Bertram Jr. 245 56 24 RdM2c " " " " " "
19 MALINOWSKI, Francis A. 822 96 55 BM2c " " " " " "
20 MALONE, John J. 602 53 48 TM2c " " " " " "
22 MANTZ, Henry 961 17 44 S1c " Wounded " Trans. To Hosp Ship. 23 MARCHITELLI, Anthony Anniable 707 66 92 GM3c " " " " " "
25 MARSHALL, James J. 761 76 59 RdM2c " " " " " " " "
26 MARTIN, William H. 837 38 01 RdM2c " " " " " " " "
28 MASSARO, Ralph M. 809 44 76 S1c " Wounded " Trans. To Hosp Ship. 30 MATTESON, James F. 844 98 49 EM3c(T) " " " " " " " "
5 MC EACHERN, Allen C. 761 75 27 SoM1c(T) " Wounded " Trans. To Hosp Ship. 6 MC FARLAND, Burr K. Jr. 611 30 12 WT1c " " " " " "
9 MC KAY, Dale 966 18 53 S1c " " " " " "
10 MC KENZIE, William J. Jr. 708 49 99 QM3c(T) " " " " " "
11 MC KINNEY, Albert J. 908 84 79 S1c " " " " " "
15 MEDEIROS, Manuel 801 56 10 F1c " Wounded " Trans. To Hosp Ship. 17 METCALF, Eulus E. 844 82 50 F1c " " " " " "
21 MILLER, Russel Blaine 280 03 65 TM2c " " " " " " " "
22 MILLERET, Arthur 956 63 04 S1c " " " " " " " "
24 MIXON, Joe L. 838 23 35 S2c " " " " " "
25 MOE, Leland M. 305 97 98 EM2c " " " " " "
26 MONTIGNEY, Ralph D. 761 78 45 S1c " Wounded " Trans. To Hosp Ship. 29 MOYER, Robert F. 805 22 56 FC3c " " " " " " " "
13 PAYERL, Eugene J. 225 11 18 GM2c " " " " " " " "
14 PEASE, Merle R. 305 37 85 GM3c " " " " " " " "
15 PERDUE, Gerald G. 608 80 82 MoMM1c(T) " " " " " " " "
19 PHILLIPS, Freeman H. 573 16 65 S1c " Wounded " Trans. To Hosp Ship. 20 PHILLIPS, James Clemit 272 58 19 SC1c " " " " " "
23 PRAMICK, Stephen J. 249 72 03 RdM3c(T) " " " " " "
26 RADELL, Thomas W. 708 90 06 EM2c " " " " " "
27 RAMOZ, Isreal A. 842 66 49 S1c " Wounded " Trans. To Hosp Ship. 28 RAMSEY, Gordon A. 311 59 54 CY(AA)(T) " Survivor " Trans to BuPers for Temporary Duty. 30 RECHKEMMER, John B. 321 91 56 F1c " " " " " "
3 ROANE, William T. 266 23 26 BM2c " " " " " " " "
5 ROEDER, Delbert W. 876 70 12 S1c " " " " " "
6 ROLLER, Samuel M. 848 96 68 S1c " Missing " " " "
7 RUNDQUIST, Vincent A. 611 48 45 S2c " " " " " "
8 SCHANCK, David L. 707 58 15 GM2c " Killed " " " "
9 SCHNEIDER, Richard 291 64 85 MM1c " Wounded " Trans. To Hosp Ship. 11 SEHL, Eugene D. 952 94 26 F1c " " " " " "
17 SLATER, Raymond W. 761 84 18 S2c " Wounded " Trans. To Hosp Ship. 20 SON, Pren Lavern 866 04 34 Cox(T) " " " " " ""
25 STITT, Clarence J. 627 11 17 S1c " " " " " "
26 STOWE, Lawrence L. 306 47 42 S1c " " " " " "
27 STRAND, Thomas E. 655 02 36 B3c " Wounded " Trans. To Hosp Ship. 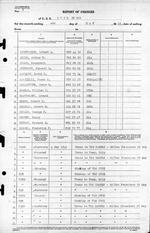 30 SUTLIFF, Louis C. 238 49 06 CWT " " " " " " " "
2 TEATER, Edward E. 880 85 05 S1c USNR " " " " "
3 TENNANT, Floyd B. 871 10 80 S1c " Wounded " Trans. To Hosp Ship. 5 THOMAS, Willie B. 269 16 75 Ck2c USNR " " " " " " "
7 THOMPSON, Wilkiw E. 838 75 75 S1c " " " " " "
8 THURLOW, Maynard A. 926 84 91 S1c " " " " " "
9 TIBBS, Charles A. 311 90 34 Cox " " " " " "
10 TIER, George M. 663 76 94 MM1c " " " " " "
12 TORONTO, Michael V. 812 33 17 MME3c " Wounded " Trans. To Hosp Ship. 14 TRAVIS, Orlo C. 820 67 19 F1c " " " " " " " "
18 UCIC, Louis J. 243 65 44 CCS(T) " Wounded " Trans. To Hosp Ship. 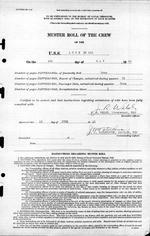 20 VALL, Harold 865 41 18 S1c " " " " " "
23 WALLACE, Paul L. 627 72 82 F1c USNR Wounded " Trans. To Hosp Ship. 27 WELLS, Rudolph R. 944 34 47 S1c " " " " " "
29 WHITNEY, Arthur L. 552 84 67 MM1c " " " " " " " "
1 WIECE, Shirley 413 43 44 MM1c USNR Wounded 4 May 1945 Trans. To Hosp Ship. 3 WINDNAGLE, Robert I. 608 02 71 EM3c(T) " " " " " "
4 WIRE, Oliver P. 244 44 86 GM2c " " " " " "
8 YOUNG, Walter G. 295 97 04 EM1c " " " " " " " "
11 ZODL, Robert J. 646 57 14 Cox " Survivor " " " " " "